Rembrandt van Rijn’s The Night Watch might be the fourth most recognizable painting in the world, but it is also the most misunderstood work of the great masters. So argues Peter Greenaway CBE, the celebrated British filmmaker and academically trained artist. It is Greenaway’s authoritative floating head that explains the mystery (as he interprets it) behind Rembrandt’s masterpiece in his documentary Rembrandt’s J’Accuse (trailer here), which opens this Wednesday in New York. Greenaway bemoans the “visual illiteracy” that allows millions of Rijksmuseum visitors to dutifully gaze at The Night Watch, only to miss the ominous clues hidden in plain sight. 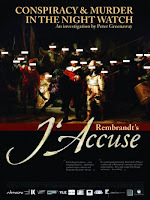 Greenaway structures J’Accuse around fifty questions based on his close reading of the painting and the circumstantial evidence of Rembrandt’s life. Though Greenaway stops short of leveling a specific charge as such, he clearly casts suspicions on one Banning Cocq, the captain of the militia company that commissioned Rembrandt’s famous painting, in the untimely death of his predecessor. Rembrandt deliberately departed from the conventions of the established Dutch “Militia Painting Style”—a decision Greenaway attaches great importance to. Like a good Poststructuralist academic, Greenaway gives The Night Watch a thorough deconstructing, with varying degrees of success. Some of his questions seem quite reasonable indeed, like why is there a smoking musket in the painting and just where did that shot go? However, some of his conjectures seem a bit fanciful, as when he finds sexual implications in where the shadow of Banning Cocq’s arm happens to point. Greenaway illustrates his case with vignettes of Rembrandt’s life using the cast of Nightwatching reprising their roles from his thematically related narrative film. While the dramatic interludes help the audience visualize the film’s characters and conflicts, Greenaway himself is a quite a compelling narrator who commands the screen with his erudition. While some of his points might be somewhat dubious, listening to him lay out the case is utterly fascinating. Yet, the obvious objection to Greenaway’s thesis remains: if Night Watch was such an obvious indictment of the nefarious Banning Cocq, why was the painting publically displayed for years at the militia’s headquarters instead of being destroyed or simply hidden away to protect the guilty? Still, Greenaway certainly convinces us there is a great deal of murky intrigue going in Rembrandt’s canvas. Though at times J’Accuse is largely an extended lecture from Greenaway, it is surprisingly stimulating visually. By evoking the warm light and dark shadows of Rembrandt’s paintings, cinematographer and visual effects designer Reiner van Brummelen further draws the audience into the painter’s Seventeenth Century world. Created with a painter’s eye, J’Accuse is an elegantly constructed documentary hybrid that will hold viewers rapt with its dazzling feats of historical speculation. It might gloss over logic from time to time, but it will definitely alter audience perceptions of the Rembrandt masterpiece. Given the prevalence of propaganda in our daily lives, Greenaway’s larger point regarding visual literacy is actually quite timely. He definitely gives an interesting demonstration of how to critically parse and analyze imagery, as well an entertaining art history lesson in J’Accuse. It opens Wednesday (10/21) at Film Forum.